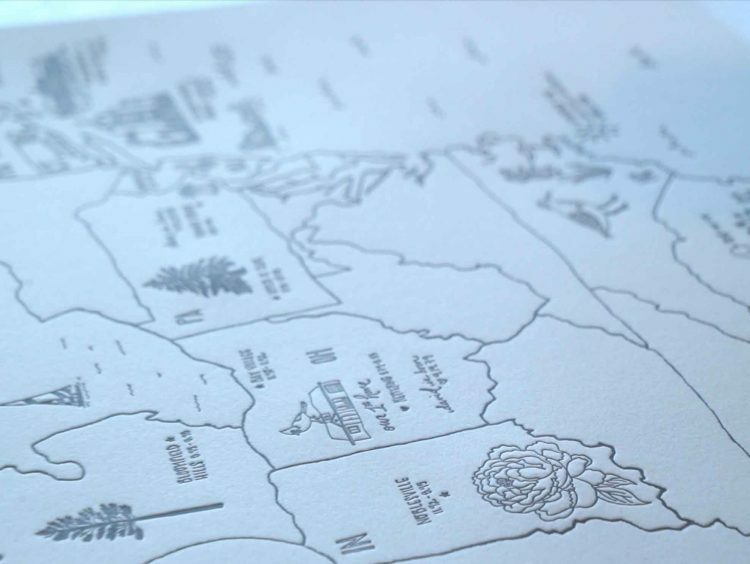 This custom letterpress map is one of the most thoughtful projects we’ve been lucky enough to help create. 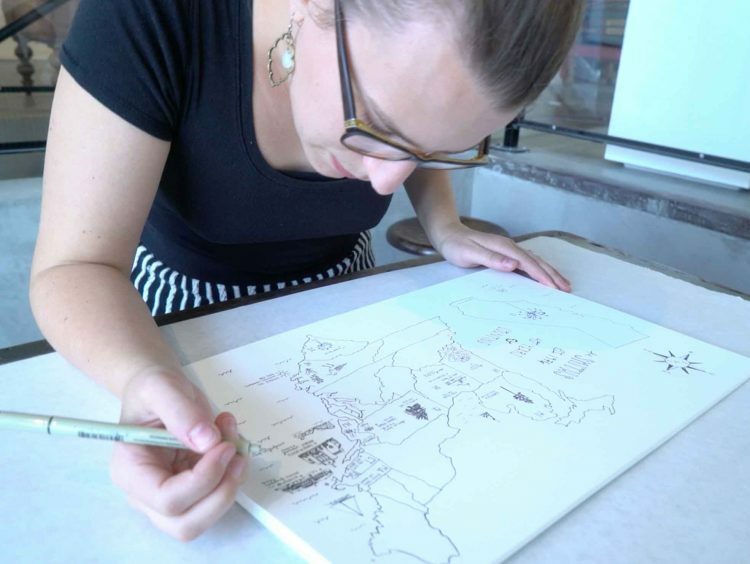 Claire came to us asking for a custom illustrated & letterpress printed map depicting milestones from her parents’ 40 year marriage. She gifted it to them for their anniversary. Photos & video by Jake Sedlar. 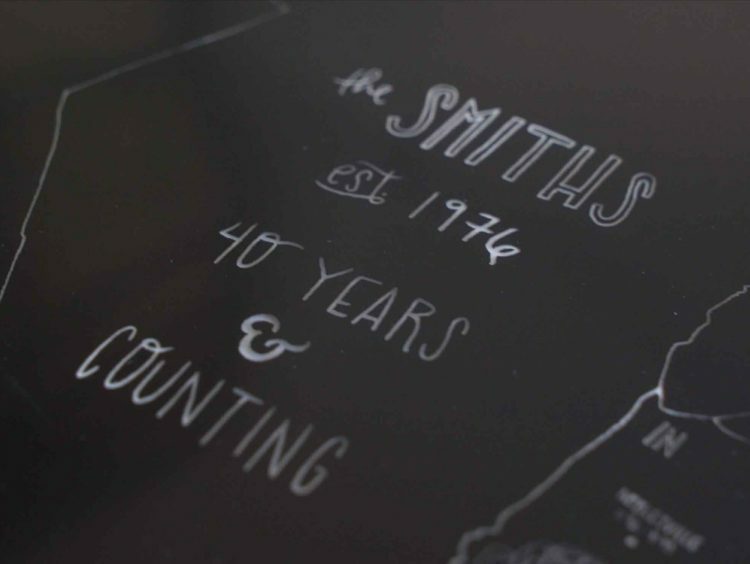 The process of creating the Smiths’ letterpress family map began with the custom illustration, created by Niki Baker of Foreignspell. 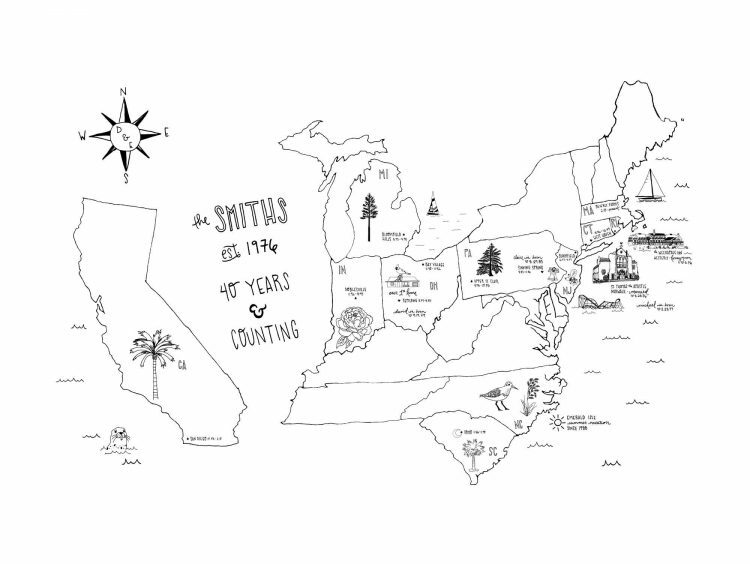 The hand-drawn map included milestones from throughout the Smith’s 40-year marriage, hand-lettered locations and text, and small illustrations along the way. 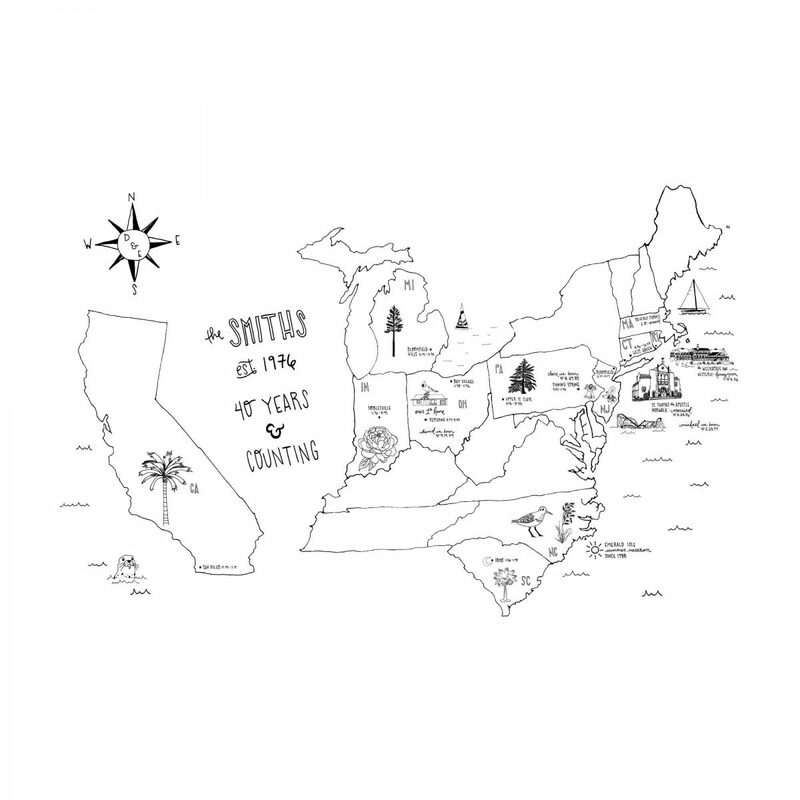 Once the map had been illustrated, inked, and finalized, we converted it to a digital file. 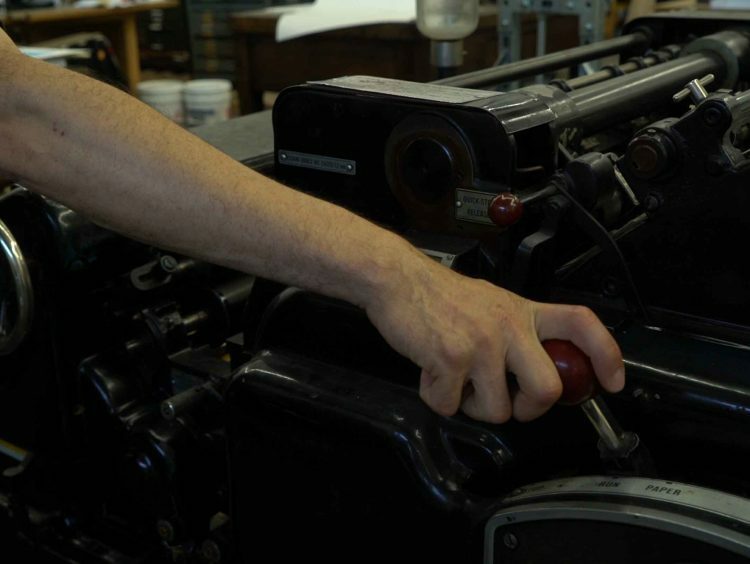 Digital files for letterpress printing have to be as clean, precise, and as true to the design as possible. We use vector files to create our polymer plates so that the lines will be smooth and accurate in the finished product. Although we often use lead and wood type for projects like posters and calling cards, we usually need to print from a photopolymer plate when printing a custom job. Working digitally gives us access to the full range of typefaces that area available, instead of keeping us limited to what we physically have in the shop; it also allows us to incorporate imagery. When we’re working from an original illustration, we take a clean scan of the artwork and then use vector editing software to turn it from a jpeg into a file that’s suitable for making our letterpress plates. Once the artwork is ready, we output the file to a dense, black film negative. This is not an inkjet, like the positives you might use for a silkscreen. Instead, we have to use an imagesetter and developer, so that we can achieve a very opaque negative. 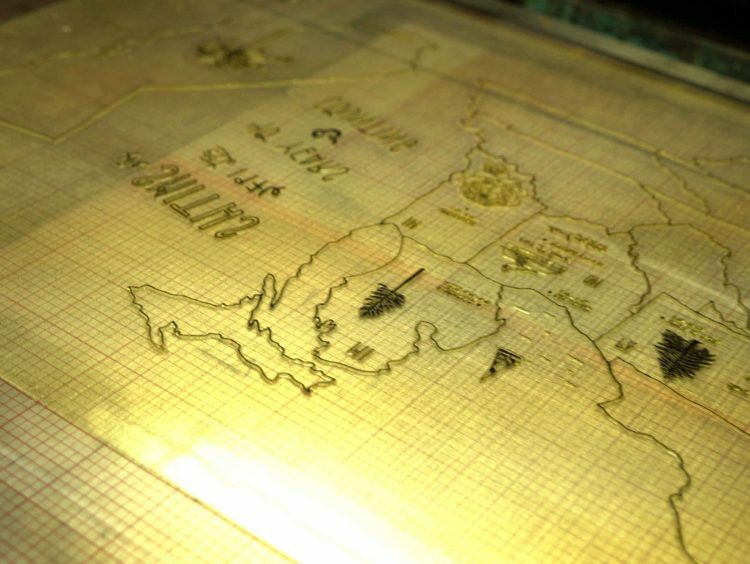 From there, we use the negative of the map to expose photopolymer under UV lights to create the letterpress printing plate. 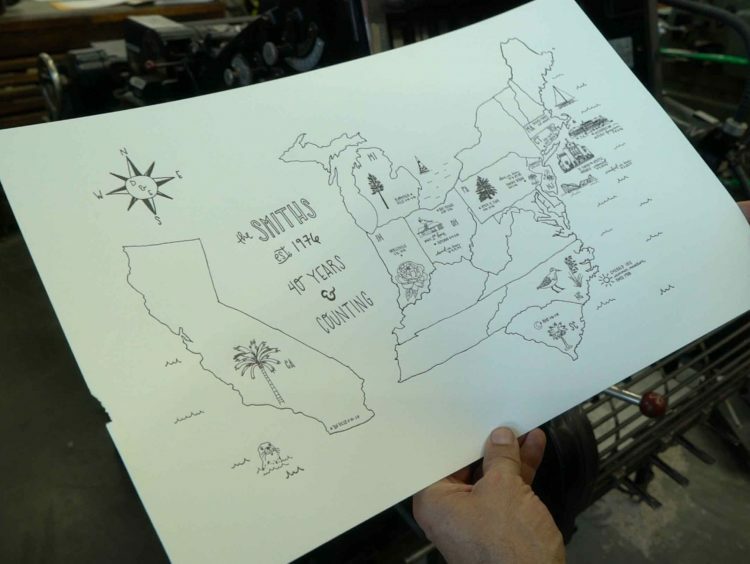 Once the plate was ready, we took the map to press, where the plate was mounted on a gridded base, inked up, and printed. 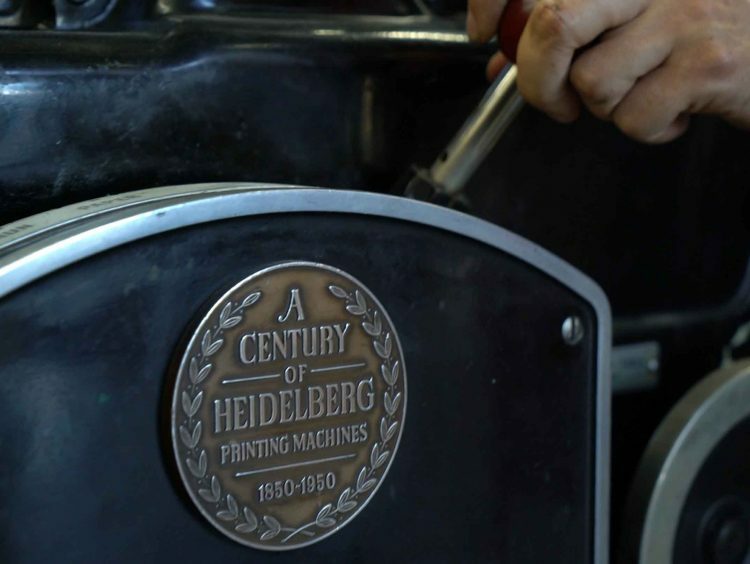 Because the Smith’s map is large, we used our Heidelberg Cylinder letterpress for this purpose; when printing smaller pieces we often print on the Heidelberg Windmill, which you can see in an earlier shot in the video. For this particular project, we got to take one final artistic step that isn’t typically part of our work. 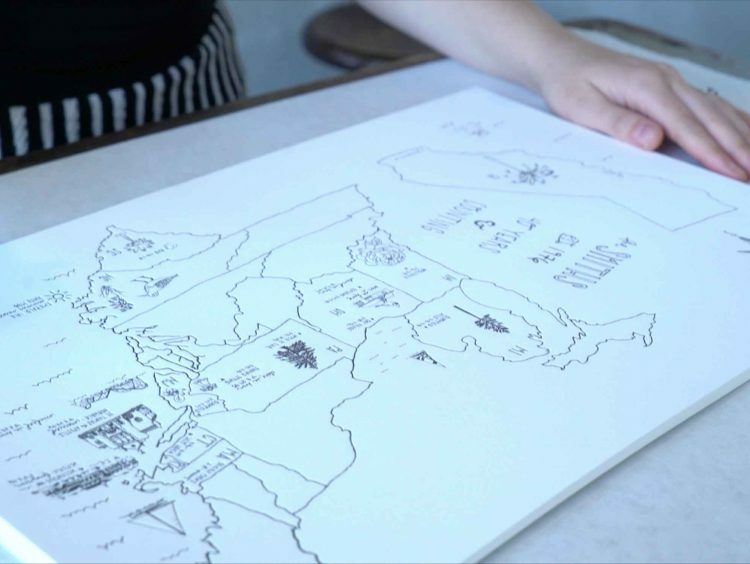 In the final shots of the video, you can see Niki curating and then editioning the maps. 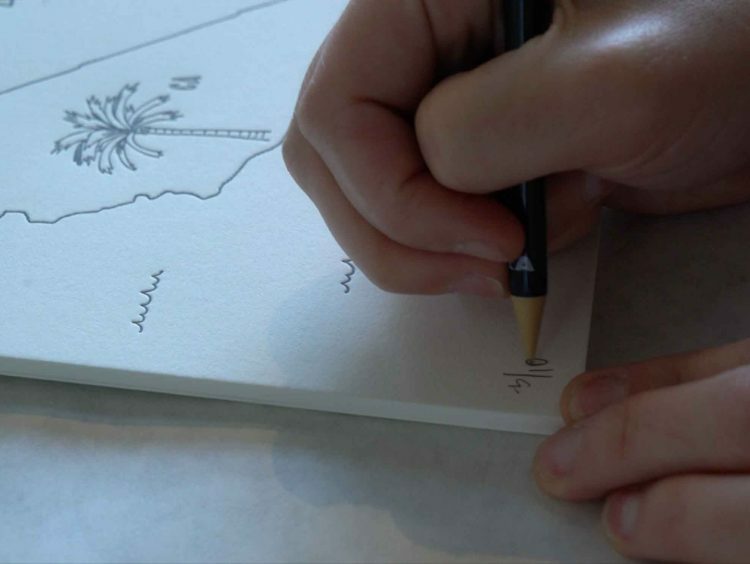 Editioning is a formal process of signing art prints (or any artwork created in multiples). The artist signs and also numbers each copy of the print, which is a mark of authenticity and also shows how many copies were printed. When an edition of prints is signed and numbered, that amounts to a promise not to print more copies – hence the term “limited edition.” It is then the rarity of the print that determines the value. 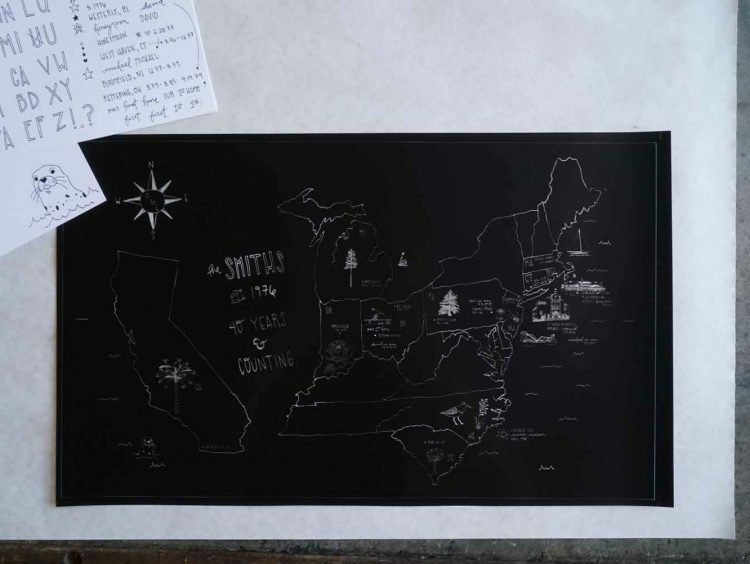 Of course, because this was a family map, it was not being offered for sale, but creating a formally signed and numbered edition enhanced the experience for each family member who received one. Jake Sedlar did a beautiful job capturing the whole process from beginning to end in the video above. We’re so happy that we can use it to let you into the print shop a little, no matter where you are!